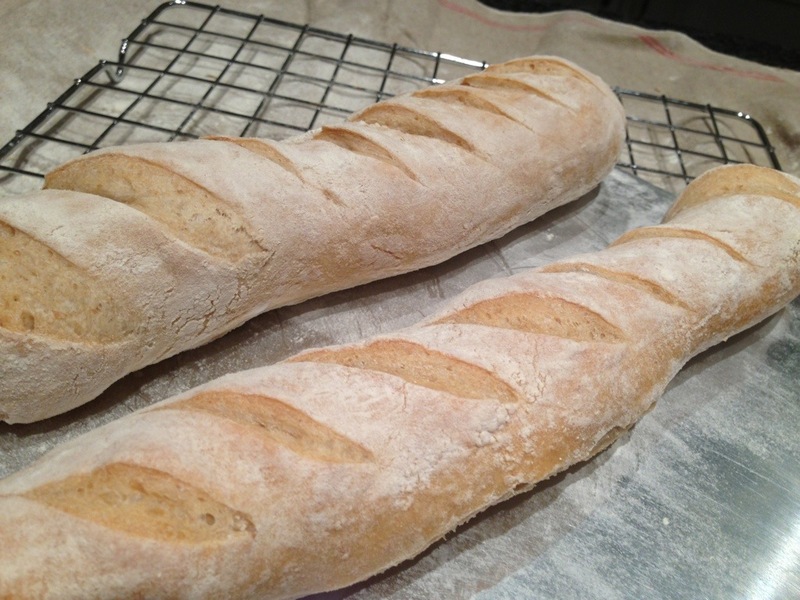 Baking bread at home is a simple pleasure, one that far too few of us enjoy on a regular basis. I’m not talking about using a bread maker to chuck out misshapen bricks Mr Cameron. It’s very easy to make bread by hand, and the results will be much, much better and cheaper than paying for a machine to make it for you. Baking a fresh loaf is one of the most rewarding jobs in the kitchen, when you pull your first from the oven I promise you, you will feel a sense of pride. The simplest of loaves consists of 4 ingredients. Flour, water, salt and yeast, a far cry from the processed sliced variety which contain considerably more. Once you get used to what you are doing you can knock out bread pretty quickly, the actual ‘work’ takes as little as 15 minutes but you need to let the yeast do its work so proving time and baking probably mean baking bread takes about two and a half hours. It’s not something you can do every day with a full time job but at the weekends it’s a great way to start your day off. I tend to get up, spend 15 minutes weighing and kneading the dough before leaving it to prove for an hour or so. It’s a great way to de-stress after the working week. 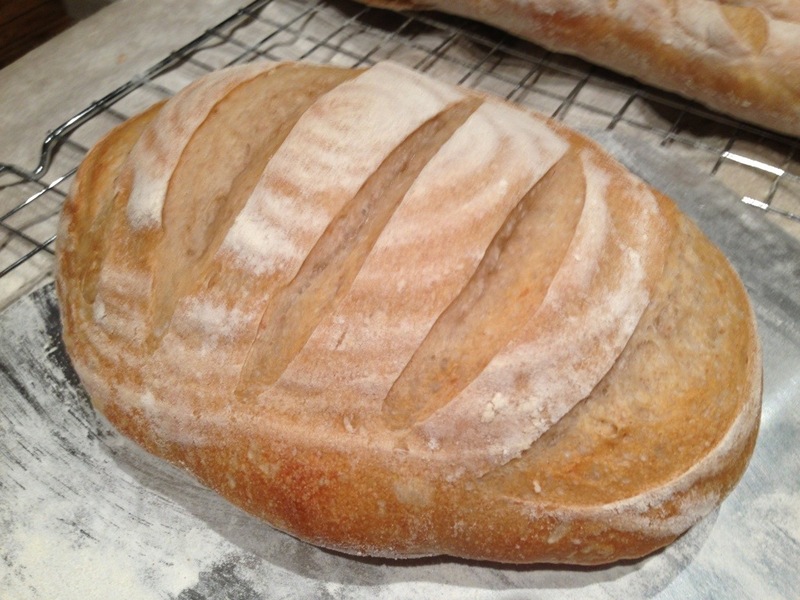 The simplest leavened bread (with raising agents, usually yeast) is this white bread recipe. One you have mastered this you can try any number of combinations. While you can make bread with virtually no specialist equipment, I would recommend getting hold of some digital scales, as it is as much a chemical reaction as it is a recipe. While I am happy to wing it with most of my cooking, baking is the one discipline where I am always precise. Measure the flour and salt into a mixing bowl and then weigh the water (it is far more accurate than judging by a line on an old measuring jug). Dissolve the yeast in the water before adding to the dry ingredients. I use a plastic scraper to combine them together by circling the bowl, a piece cut out of an ice cream tub should do the trick. As you combine the mix will slowly become wetter. Once fully combined turn out onto a work surface to knead. DO NOT dust the surface with flour. The measurements we have made are precise for a reason, adding more flour at this point simply changes the recipe and will likely result in a heavy loaf. If you are concerned the dough will stick then a tiny splash of oil on the surface will suffice. The dough will appear wet and unresponsive to begin with but believe me as you work the dough, the gluten in the flour becomes more elastic and the water is absorbed more completely. After kneading the dough for 5-10 minutes the surface will become shiny and smooth. That’s when the dough has been kneaded enough. 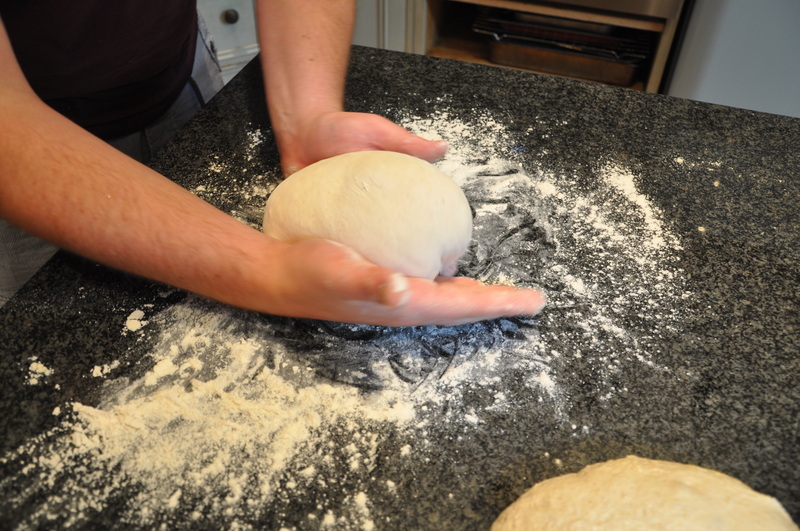 You should be able to stretch the dough quite far before it breaks due to the gluten’s elasticity. I will not deny that this is something that you learn instinctively and first time you may find it hard to judge. As long as the dough is no longer sticking to everything you should be ok, after the first proving the dough will be far more forgiving to handle. I have added a video of Richard Bertinet a well known master baker, illustrating how to knead and shape dough, as he can demonstrate much more effectively than I can! Incidentally his classes in Bath are excellent. Place the bread back in the mixing bowl and cover with cling film or a damp tea towel. It’s a good idea to rub a little oil or melted butter over the surface of the dough to stop it drying. Leave to prove until it has roughly doubled in size, the timing of this varies enormously depending on what yeast you are using and the ambient temperature of the room. This is quite a crude term for what is essentially pushing the air pockets out, that the yeast have formed. 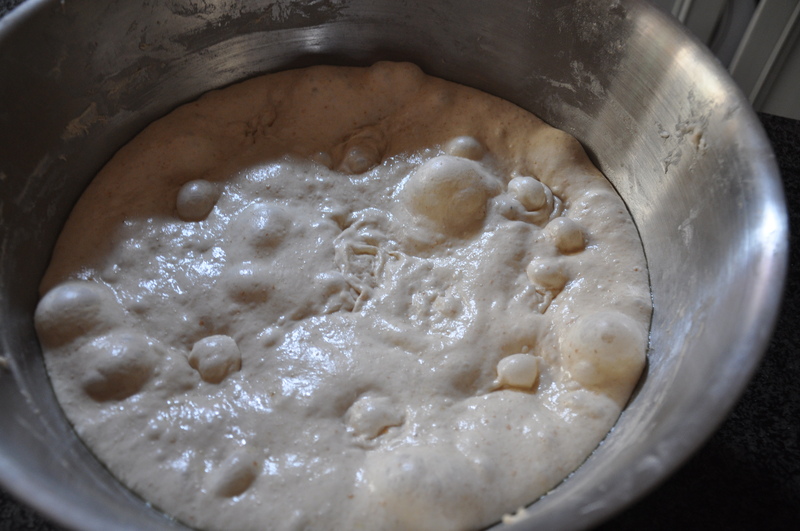 The dough having doubled inside should feel lighter and easier to handle. 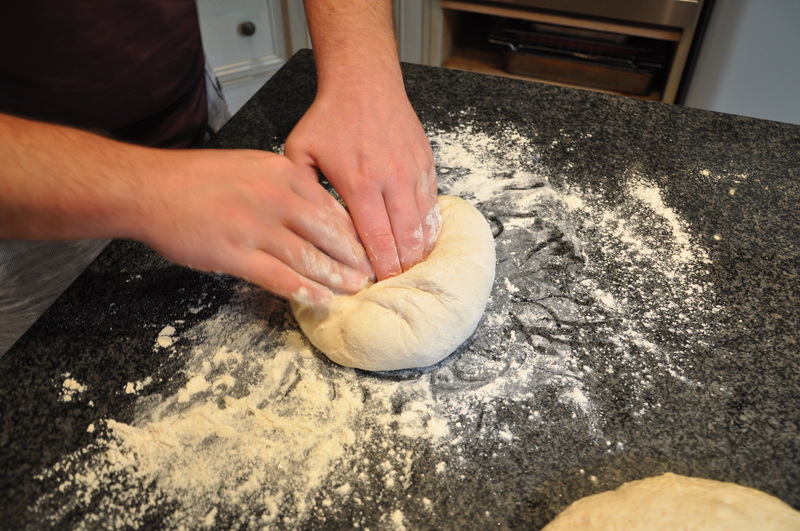 Turn out onto the surface and lightly press down all over, we now need to shape the dough. The mixture above will make 2 large or 3 small loaves or a mixture of loaves and bread rolls, rolls are probably the easiest to start with and take the least time to rise on the second proving and bake. Cut your dough into chunks depending on how many loaves/rolls you want. 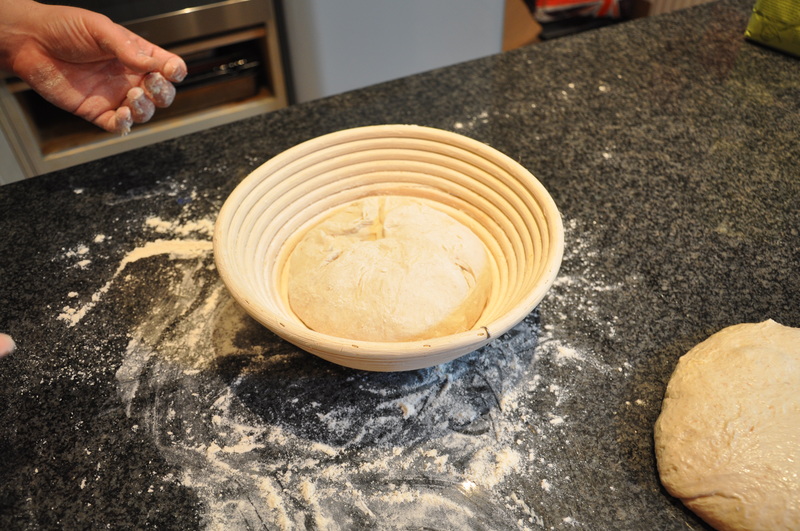 Once you have the dough evenly divided, take its piece of dough and, flatten and start to fold it in on itself to create a ball, the point of this is to build up structure in the dough so it rises properly. If you simply cut a piece off and chuck it in the oven it will bake but it will be ugly and uneven. Again let the dough rest until it has almost doubled in size again. I simply cover the loaves on the work surface as I have a a bakers peel to move them to the oven but if you are concerned about transportation place them on a baking sheet but make sure there is ample room for them to expand. Turn the oven on to its highest setting at this point, hopefully around 240 degrees celcius (460F). I have a granite worktop saver that I got from amazon for a tenner which I use to bake bread on, much cheaper than a proper baking stone and does the job. You dont need one, bread will bake happily on any oven tray, but it does give more lift and a better crust. So if you have a baking stone it should have been in the oven while the second prove was going on to get properly heated right through. Back to the dough. Hopefully the dough will have risen again. If you press a finger into it, it should spring slowly back if it has good structure. Next you need to slash the top of the loaf. If you don’t do this the bread is likely to split in uneven places as it rises and the crust forms. It is more pleasing to be in control of the look. You can buy specialist knives for this or use a razor blade but I favour simply a serrated bread knife. Make a few clean slashes in any design you like. That’s it, its ready for the oven, place in the oven on the tray or transfer to the heated stone. Once in you can drop the heat a little to around 200. 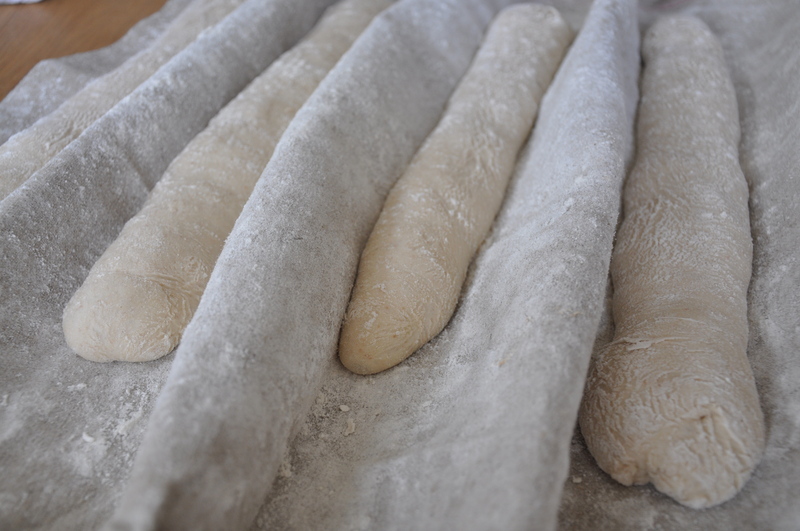 The reason for having the oven temperature so high to begin with is that you lose a lot of heat when opening the door and bread really needs early high heat to get that initial rise. Depending on the size of your loaf the bread should take around 30 minutes to bake, rolls only 15-20. Take out, leave to cool on a rack so the steam can escape and then enjoy with simply with some butter, can’t beat it!